BOSSIE'S RULES OF ENGAGEMENT: Dear Mr. President, one of your closest allies and loyal defenders was the chief investigator for another embattled president in the 1990s. 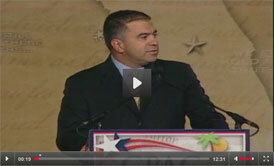 David Bossie was Rep. Dan Burton's (R-Ind.) wingman on the House Oversight Committee when Republicans searched for every skeleton in Bill Clinton's closet — and then some. He helped ferret out information on everything from Vince Foster to Whitewater to Monica Lewinsky, culminating in a successful bid to impeach the then-president. So if you haven't already picked Bossie's brain on how to prepare for the onslaught of subpoenas and investigations coming your way from House Democrats in January, we did it for you. And there's something from Bossie for everyone: Having been in their position 20 years ago, he has some timely advice for the Democratic committee chairs eagerly waiting to dig deeper into Trump's alleged links to the Kremlin, the payments to Stormy Daniels and the spending habits of current and former Cabinet officials.